Nicki Minaj reps for the ladies on the national level right now. And Zulu Queen Michele and Niagra preserve hip-hop in the region. 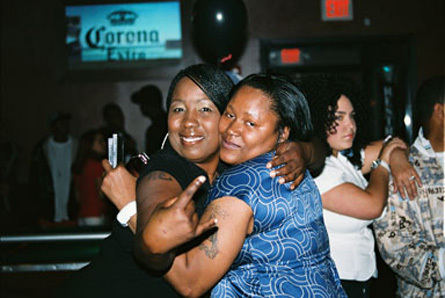 From left to right in the photo above: Zulu Queen Michele, hip-hop historian/educator for the Zulu Nation, and local MC Niagra show each other love at local rapper Da Ritt’s album/DVD release party. Photo by Leon Laing. Michele and Niagra will be part of the panel for the Hip-Hop Against Violence event in Harrisburg on May 8. See below for more upcoming events. April 18: Jason Derulo. 9 p.m., Henderson Gym at Shippensburg University in Shippensburg. Web: http://www.ticketmaster.com. April 9: Drake with K-OS and others. 8 p.m., the Bryce Jordan Center in State College. Web: http://www.ticketmaster.com. May 1: Corinne Bailey Rae. 9 p.m., Theatre of Living Arts in Philadelphia. Phone: 215.922.1011. May 8: Hip-Hop Against the Violence. 1-9 p.m. at The Armory in Harrisburg. Web: http://www.myspace.com/zuluqueenmichele. June 19: Maxwell and Jill Scott. 7 p.m., Wachovia Center in Philadelphia. Web: http://www.ticketmaster.com. April 2: Venus vs Mars: A First Friday Experience. 10:15 p.m. Sasha’s Hideaway in Harrisburg. Web: http://www.denm-inc.com. April 11: Soul Comedy Café with comedians Eddie Bryant, Richie Redding and host Turae. 8 p.m. Harrisburg Midtown Arts Center in Harrisburg. Web: http://www.denm-inc.com.